An international collaboration of primatologists, sponsored by The Leakey Foundation, has gleaned evidence from decades of observations of orangutans that the apes show behaviors that are culturally based. The scientists findings push back the origins of culturally transmitted behavior to 14 million years ago, when orangutans first evolved from their more primitive primate ancestors. Previous evidence for cultural transmission in chimpanzees suggested an origin of cultural traits 7 million years ago. "First of all, this finding emphasizes that human culture didn't just arise de novo, but reaches far back in evolutionary time," said first author, Carel van Schaik of Duke University. Van Schaik and his colleagues distinguish four kinds of culture -- labels, signals, skills and symbols -- of which the Great Apes have shown the first three. Human culture is distinguished by far more sophisticated development of all four, he said. However, observations of chimpanzees and orangutans have revealed hints of symbol use, and further study might reveal clearer evidence of symbols. 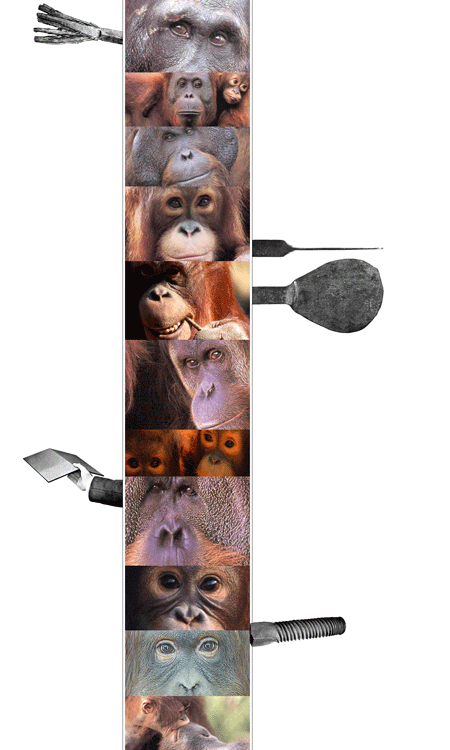 >from *Evidence for Orangutan Culture. Findings push back origins of culture to 14 million years* january 2, 2003.